RUNNING MAY 6 – 11, 2019. 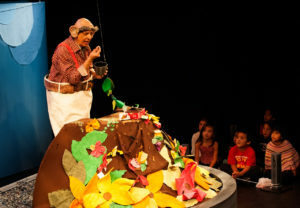 Presentation House Theatre is thrilled to present Linda A. Carson’s enthralling new spin on the much-loved children’s classic, Jack and the Beanstalk. This imaginative adaptation finds Jack, a farmer’s son, surrounded by land that just won’t grow anything. Compelled to sell his beloved toys to feed his hungry family, Jack instead trades them for magic beans, from which a towering beanstalk grows. Jack climbs the beanstalk and is taken on an amazing journey filled with excitement and peril. Children, young and old, will delight in this simple, but highly engaging, environmental tale.